A recent article in the Local Government Chronicle published just before schools broke up for the summer (subscription required) looks at how local authorities deal with home educating families and holds up Cambridgeshire as a model of good practice. Extracts from Graham Stuart’s article are italicised below. Parents who have opted to home educate their children are often left bruised and bewildered by the attitude of their local authorities. Educating a child at home is a parent’s preferred choice in a minority of cases. Mostly, they do so because their child is struggling to thrive or cope in mainstream schooling. They want the best for their child, yet too often they are made to feel under suspicion by the local authority that should be there to support them. The article regrets that some councils still focus on investigating home educating families, despite Government Guidelines and advice from the Department for Education. 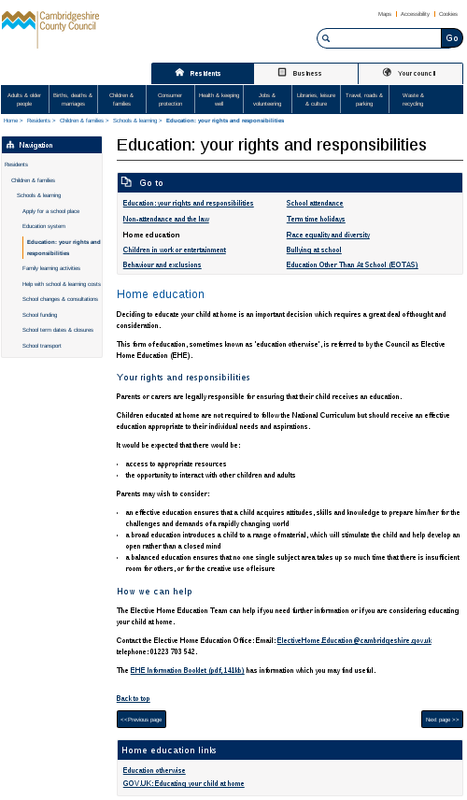 Parents, not the state, have the statutory duty to educate their children, yet when parents do so directly, officials often think parents are obliged to prove to them that the child is receiving a suitable education. Worse, councils often conflate home education with a child safeguarding risk and seek to impose routine monitoring and inspections. There is no legal duty for councils to carry out active investigation of home educating families and Graham Stuart says that doing so will only drive a wedge between home educators and the local authority. These actions are at odds with government guidelines and can be accompanied by misrepresentation of the legal situation both on parents’ doorsteps and in local authority literature. This attitude is counterproductive. Local authorities should be the servants and not the masters in their relationships with home educators. Graham Stuart goes on to say that where there is a very limited budget, why not spend the money on support rather than policing? Neither are statutory but offering support will improve educational outcomes as well as giving families a positive reason to interact with the council. The limited resources councils have available should be used to give educational support to parents, such as teaching materials or exam fees. This would not only be beneficial to the child, but could also foster a better relationship with home educating parents. The example of Cambridgeshire proves that this isn’t just wishful thinking. The confrontational attitude of some local authorities is, I hope, on the wane. Cambridgeshire CC, for example, has in the past year completely changed its home education service. The monitoring regime was contentious with local home educators, including its insistence on annual inspections, but now, the local authority assumes parents are providing suitable education for their children unless evidence suggests they are not. In Cambridgeshire, the new menu of support has evolved from a combination of discussions with home educating families plus the service manager Karen Beaton keeping an eye out for examples of good practice from other authorities such as Hampshire paying exam entry fees. Graham Stuart gives some examples of the council’s new approach. Cambridgeshire will pay a contribution towards home educated children’s year 11 exam fees and is looking to purchase careers advice for home educators and information sessions from the educational psychology service. Not everything costs money. Some of the changes are about a different use of staff time with a new focus on outreach and development work. Of course, there are many professionals who will come into contact with home educating families and the home education manager sees it as part of her role to explain the law on home education to avoid any misunderstandings. This demonstrates learning from Serious Case Reviews since it is a frequent recommendation, and is also an integral element of the reformed service in Lancashire. Also, the home education service has briefed children’s services and there will be engagement with health services to increase awareness about the law on home education. The changes in Cambridgeshire are a model of good practice. It takes political courage to view home education as good rather than as a risk but, if councillors in Cambridgeshire can do it, others can too. This is a fantastic read and very compelling. Well done! I agree it’s very encouraging! The great thing about the changes in Cambridgeshire is that they have resulted from the simple process of talking it through. We discovered that Karen from the LA was as keen as the HE families were to revamp the whole process to better reflect the law, which helped diffuse any sense of threat on either side. She described how, having come into post 3 years previously, she had been on a journey of gaining understanding about HE, and realized that the way things were happening at the LA were not helpful. It was willingness from both Karen and HE parents to communicate openly and positively that enabled change to happen very smoothly. We now have a regular forum in place to keep that communication and cooperation happening. Thank you for posting this background on how the changes came about. I know other areas with “forum groups” or “network meetings” and the key seems to be in keeping a regular channel of communication.